17th May 2018, New Delhi: The Central Government will be completing 4 years in power this week. These years have been full of action on both fronts for the Government – on one hand they have been applauded for taking some bold steps like the surgical strikes against Pakistan and on the other hand, they were criticized for their inaction on enforcing the chewable tobacco ban or addressing the deadly air quality in North India two years in a row. India’s largest community social media platform LocalCircles asked citizens to rate the different Government Ministries based on the work they have done in the last 4 years. More than 10,000 ratings were submitted on LocalCircles, making it one of the sizable and independent rating exercise of its kind. Not surprisingly, citizens rated Ministry of Defence as the best performer giving them a rating of 4.9 out of 5. Ministry of Labour & Employment and Ministry of Agriculture stood last with a rating of 2.1 out of 5. Handling of Pakistan, countering terrorism, increase in budgetary spends on defence etc. had a major role in citizens rating Ministry of Defence highest. The surgical strikes conducted to destroy terrorist training camps by crossing the Line of Control sent a strong message around the world that India has had enough, and terrorism will no longer be tolerated. Ministry of External Affair stood second with a rating of 4.2 out of 5. This could be accredited to MEA’s exceptional work done in evacuating India’s from the war-torn areas in the middle east, and the cordial relations that they have been able to build with countries across the world. External Affairs Minister Sushma Swaraj been the crown jewel of the ministry by being accessible of social media and personally making sure that Indians in emergency situations in any part of the world are taken care of. She won the hearts of people when she made sure that 19 Pakistani school girls who had come to India for a Youth Festival, were taken care of and reached home safely. This was a few days after the surgical strike. Ministry of Agriculture and Ministry of Labour and Employment ranked the lowest. The dismal ratings of Ministry of Agriculture could be due to the growing discontent of people about the condition of farmers and the growing rate of farmer suicides. Farmers have continuously been struggling with inability to pay debts, successive crop failures and low yields. Although some states have decided to waive of some of the farmer loans, much more will have to be done to raise the image of the Ministry of Agriculture in the eyes of the citizens. With the rate of unemployment being high, citizen rating of the Labour & Employment ministry was almost obvious. Although the extension of maternity leaves was received well by the citizens, not enough new jobs being created for the youth was a major point of discontent among citizens. 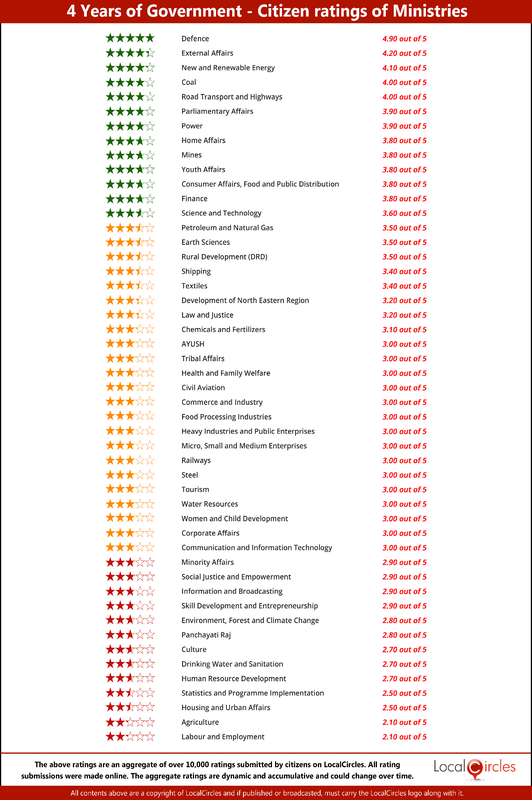 Overall, only 16 out of 49 ministries received a citizen rating of 3.5 and above. This clearly shows that the ministries will have to tweak their working style a bit to please the general population of the country.